Every time a new console is announced, the first question on everyone’s minds is “will it be backwards compatible?” We are happy to tell you that on 4.16.19 Playstation’s Mark Cerny confirmed the PS5 will be backwards compatible with PS4 games. That being said the fear of a new generation invalidating all of our purchases from the previous one is very real in gamers everywhere. The very structure of the PS4 was completely different than the PS3, which was the basis for why Sony said the PS4 could not be backwards compatible. Even so, they’ve made concessions here and there. Looks like they are getting it right for the PS5. Meanwhile. Microsoft is making more and more Xbox 360 games compatible on the Xbox One every week. Sony’s been backed into a corner. It’s time to bring out the claws and make backwards compatibility a feature on PS5. Thankfully, rumors are pointing to this being the case. The PS4 is absolutely killing it this generation, with millions of consoles now comfortably sitting in gamer’s homes. That’s an impressive install base, but if Sony releases a brand new console without backwards compatibility, they would essentially starting from scratch. Yes, the PS4 would continue to exist for several years, but when it comes time for the PS4 to go the way of the dodo bird, all those gamers will have a huge library of games that they can no longer play on PS5. It doesn’t make sense any way you slice it, and with Microsoft already offering backwards compatibility on Xbox One X, so Sony had to step up. Breaking this down, the excerpt describes an issue with running legacy software on more or less powerful CPUs. If the hardware is more powerful, such as the case with PS5, there could be unintended consequences of throwing an older game into this new environment. 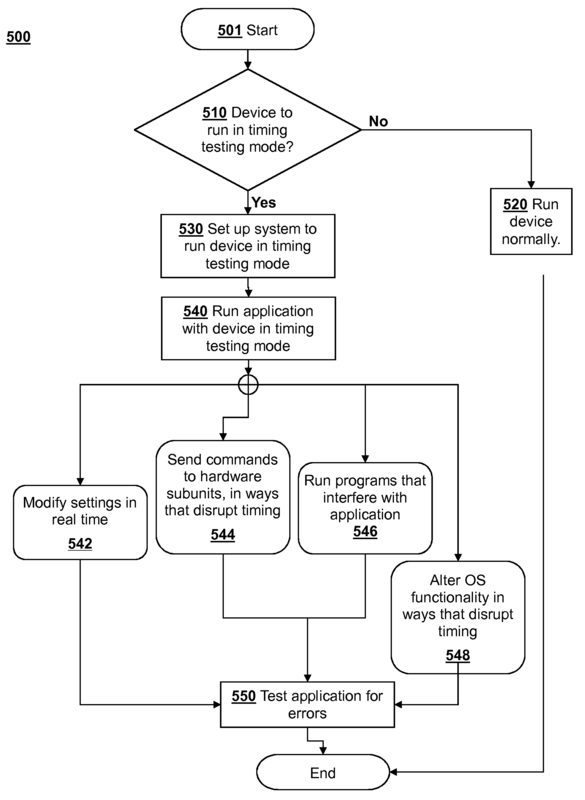 The official description of the images describes it as a block diagram that showcases an example of a CPU core that can be configured to operate in a backwards compatibility mode. It’s hard to say if this could be applied to PS4, as the console is in the final stages of its life cycle according to Sony, but it most certainly points to backwards compatibility on the PS5. Admittedly it’s a lot of corporate speak, but the accompanying graph shows an interesting trend. As each console launches, profits go down by a large margin until later in the cycle when they go back into the green. Many believe, myself included, that this drop in sales is due to people waiting to purchase the new console because they don’t want to lose their entire library. Backwards compatibility with, at the very least, PS4 games, would most likely mitigate this drop in profits by encouraging people to upgrade and carry over all of their physical and digital purchases from the prior generation. The chipsets in both the PS4 and the Xbox One are made by AMD. It’s more than likely that the next generation (now confirmed!) will also utilize chips from this manufacturer. Now, one of the biggest changes in hardware from the PS3 to the PS4, was the architecture itself. The PS3 had a proprietary cell processor that, while powerful, was difficult to develop for. The PS4 that we know and love was designed to be more like a PC in this regard. We’ve already reported on evidence that Sony could be using AMD’s Ryzen architecture on the PS5, but if this is indeed the case, it wouldn’t be that much different than the current architecture. Therefore, it would be much easier for Sony to simply let you take your PS4 library over to the PS5 and this is exactly what happened! One thing is certain: Sony needs to offer backwards compatibility in some form, because Microsoft is already far ahead in this regard, and it’s one of the strongest competitive advantages they have, despite Sony winning in sales. Let’s start by taking a look at the competition. When the Xbox One was first announced, there was no mention of backwards compatibility. The same was true of PS4. A few years ago at E3, Microsoft dropped the bomb that Xbox 360 games would soon be playable on Xbox One. Since this announcement, they have been steadily adding new titles to the list. If you own the game on Xbox 360, you can simply pop in the disc and download a version of it for your Xbox One. If you owned it digitally in the past, you can download it again. If you want to buy it for the first time on Xbox One, you can do that too. Xbox 360 games are even being offered as free titles in Games With Gold promotions. On top of this, Microsoft announced Xbox One X At E3 in 2016. They went on to say that all of your games and accessories would carry forward to the new system. Microsoft introduced the concept of an Xbox One Family, where all of their games would be playable on Xbox One, Xbox One S, and Xbox One X.
Microsoft has made it clear that there will be no Scorpio exclusives. That’s a hard pill to swallow, but it’s also a massive promise in terms of backwards compatibility. This kind of sweeping stance on the matter leaves Sony with a very important decision. Backwards compatibility absolutely needed to be a feature on the PS5 for Sony to remain competitive. The first time we saw backwards compatibility was on the PS2. This system was indeed capable of playing PS1 games, but the caveat was you had to use a memory card from the original system to save your data. You couldn’t save PS2 data on a PS1 memory card. That being said, there were some PS1 games that could not be played on the PS2. This list changed based on the model of the PS2. When the PS3 released, there were several models. The 60GB PS3 was fully backwards compatible. The original 80GB model was also compatible through emulation. All other models did not have PS2 compatibility but could still play PS1 games. These systems offered the ability to make an “internal memory card” that could be used to store data from older titles. Jump to the PS4 and there was zero backwards compatibility at launch. The reason for this had to do with the system’s architecture. The PS3 had a proprietary cell processor that created some phenomenal first-party games, but ultimately alienating most third-party developers. The PS4 is designed more like a traditional PC for the purpose of welcoming quality experiencing across all developers. This shift in structure was the reasoning behind Sony’s decision to not make the new system backwards compatible. PlayStation Now is the streaming service Sony created after purchasing cloud gaming company Gaikai for $380 million. This service offers users the ability to stream PS3 games to their PS4 or Smart TV via an internet connection, much like Netflix does for video. The issues with this service are a lack of selection, high costs, and the need for a strong and reliable internet connection. It’s a noble attempt, but it’s never taken off as intended. Sony has slowly been figuring out how to make PS2 games playable on the PS4. These titles run at an upscaled 1080p resolution and include trophies. The caveat is that you have to buy them again, regardless of whether your not you own them. Prices usually hover around $14.99, but there are sales from time-to-time. Perhaps the most controversial way that Sony has been bringing games forward from the previous generation is through the release of remastered games. Many popular games like The Last of Us, Uncharted, and God of War III have been re-released on PS4 with updated graphics, higher frame rates, and DLC included. These are a double-edge sword. On the one hand, when done correctly. these new versions are vastly superior. On the other hand, people are essentially paying for the same game twice. Cynical gamers will say that this is the only way we’ll see backwards compatibility on the PS5 because it makes Sony money on something twice, but I would argue that there’s a place for these remasters. Certain games shouldn’t fade into memory. Some of them deserve to be redone and resold, if only to show a new generation of gamer’s experiences that shouldn’t be missed. I will agree that it’s a slippery slope towards cash grabs, but I think Sony knows that remasters are a business model that can only take them so far. New I.P and new franchises should be the focus, and if E3 2016 was any indicator, Sony hasn’t lost sight of that focus in the slightest. Will remasters go away on PS5? No, I don’t think so. I do think that Microsoft will force Sony to offer a more comprehensive solution for backwards compatibility, but at the same time I think several of PS4’s biggest titles will warrant a refresh on the next generation. It’s a balance. Even so, people aren’t too keen on buying these games again. So that’s where we stand with backwards compatibility on PS4. With Microsoft going full-steam ahead on a future where games works across all of the platforms currently available, Sony needs to have an answer for gamers who want a more comprehensive solution to the backwards compatibility question. Sony is clearly taking steps not to fracture the market with PS4 Pro, and this follows in Microsoft’s footsteps. If Sony could somehow bring PS3 or PS2 into the fold in a more meaningful way, then they could stand on the same ground as Microsoft. That may not be possible now, but it could be with PS5. At the very least, PS5 will play PS4 games as Sony has never been one to be beaten by Microsoft. It’s also clear that gamers don’t want to be “left behind” as Microsoft puts it. If they could perfect PlayStation Now and make it more cost-effective, that could be a real solution to the issue of playing PS3 and PS2 games on the new console. Since it’s clear cloud gaming circumvents the issues around system architecture, I believe Sony will leverage this technology on PS5 to offer native backwards compatibility with PS4 and cloud-streaming for PS3 and PS2. Ideally, by this time they will include such streaming in the cost of PlayStation Plus and not charge for it as an extra service. Of course, at the end of the day, Sony is here to serve the gamers. Do you want backwards compatibility for the PS5? Make your voice heard in the comments below! Note: The thoughts expressed in this article are the opinions of the author (Bradley Ramsey) and do not yet represent facts or the opinions of Sony Computer Entertainment. Although it will probably be accurate, for now it is pure speculation. Thanks for reading! Would love PS5 to be backwords compatible. I have a PS3 and the only reason I refuse to buy a PS4 (despite several games I want to play on the system) is the fact that the PS4 was not backwords compatible. For the love of god just make the ps5 backwards comatible. Even having to sell new discs that are compatible with the new system would be more tolerable than not having them at all. Bring back classics to give gamers a small resbit from the newer faster paced games. Please make the ps5 backwards compatible with ps1-4. Its important it get the retro games in there too. You guys have the technology to make a disc drive that works for all. Please do it for the gaming culture and not for the money grab. The disk drive is super important, it needs to be there. And at this point it should be a golden standard for consoles to do backwards compatibility. Disk drive isn’t going anywhere soon. Would love to see this feature and be able to play games from ps2 and ps3 as well as ps4 on the new ps5 console. This would definitely make me want to purchase the new console!! If ps5 comes out without backward compatibility I wont buy it. At least not in the short term, I have too much invested in ps4 games to start over!!! At this point I think it is going to have to be mandatory for PS4 backwards compatability. If not, expect people to come after Sony with pitchforks. I would LOVE to have PS2 compatability! I have a HUGE library of PS2 games that I would like to play on a modern t.v. without having to have to repurchase the game (if they even offer it) or hook up my old PS2 which sounds like it is about to die and I don’t have room to add another system to my shelf/inputs. Do it Sony! Why not just let the PS5 be able to play PlayStation 1, 2, 3, 4 & 5 games and also if possible be able to rip the games on the system. If you will please give me a response. Thanks!!! Why not just let the PS5 be able to play PlayStation 1, 2, 3, 4 & 5 games and also if possible be able to rip the games on the system. If the new ps isn’t backwards compatible I’m switching to xbox. Period. If I have to buy ALL my favorite games – AGAIN – I’m going to buy them from a company who comprehends game loyalty. I have tons of ps 1, 2, and 3 games I absolutely LOVE… but my ps 1 and 2 consoles are long dead… I’d love to play them again… abes world 1&2, sphinx and the cursed mummy, Norse by norsevest, spyro 1-3, the crash bandacoots, legend of legaia, dark cloud 1&2 (to name a few). I hope it will be backwards compatible, thank you guys so much for allowing this ability! I love PS5 so much! I just can’t wait to get my hands on it! I will for sure buy new games to, but I will love how it plays my oodles of old games to! Thanks again guys! PSRule!!! You can do that without re-releasing video games. Offer either a digital download of a game so people can play games right away or allow a patch to be downloaded so you can slip your PS1/PS2 game disc in. Pretty simple. It must have backward compatible for PS5 games for all previous PS games thats played on PS1, PS2, PS3, PS4. I own PS3. I bought it because it’s i can play my PS2 games. But i did not want to buy PS4 console. Because i cannot play my PS2 games. I will never buy console game that won’t let me play my older games. I think that would be the best move on Sony’s part to make a console to play the games backwards. Not going to keep buying games or consoles unless they make it backwards. I have the pro 4k and even bought a 65 inch Sony matching tv. Let’s see high definition remastered Tenchu Wrath Of Heaven and Tenchu Fatal Shadows on PS5. I’d pay big $$$$$ for this. And I mean like complete graphics and audio overhaul but leave the rest of the game the same. I have PS2 PS3 and PS4 hooked up to my tv. I have a vast collection of games. PS1 – PS4. I would love to just pop them into the PS5 and be able to play any of them. It would save valuable time and money. It would also secure the bond between Sony and their fans. The mutual loyalty reciprocated would be appreciated. Plus secure many more years of eager gaming and purchases in the future. Thank you Sony.